Never transport your batteries with other metallic objects or electrical conductors in your pockets or a bag, without protection: the simultaneous contact of the positive and negative posts of your batteries with metallic objects may provoke an uncontrolled discharge and short circuiting, leading to the emission of toxic gases, or quite simply an explosion... Best to choose a suitable travel case. The Efest Purple 26650 5000mAh 45A is the new version of the 26650 Flat Head battery made by Efest. 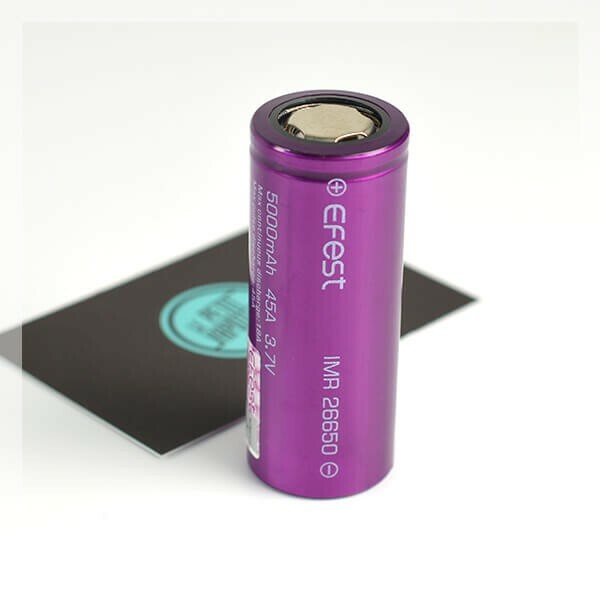 The Efest Purple 26650 5000mAh is a Li-Mn (Lithium-Manganese) battery which is convenient for sub-ohm use (up to 0.15 ohms). With the 5000mAh capacity and tenfold autonomy, it can have a discharge current in Pulse of 45A (18A in Continue). The Efest Purple 26650 5000mAh is perfectly convenient for the Nebula, Pico Mega, Ijoy Lux Boxes. 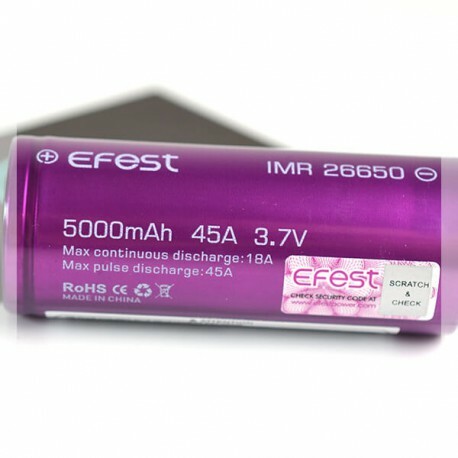 The Purple 26650 mAh 45A is made by Efest. The batteries must be stocked and transported in the secured storage cases/boxes. The new Efest battery, type 26650 has excellent autonomy and allows a long term vape, which can be used with coils in sub-ohm (up to 0.15 ohms - advised in VW, Bypass and Meca Mod). This Efest Purple 26650 5000mAh functions with the chemical Li-Mn (Lithium-Manganese), with a Continued discharge current of 18A and 45A in Pulse. The Purple 26650 mAh 45A battery is made b Efest. Pas encore teste ! J'espère pouvoir vapoter 2 fois plus qu avec mon ancien bien moin puissant ! Accus arrivé déchargées...casi à zéro et tiennent à peine une journée...5000mAh pourtant.